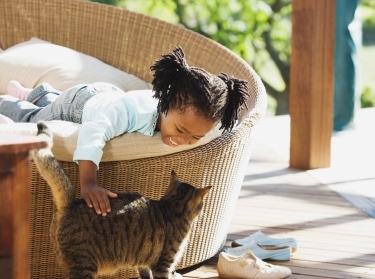 Contrary to popular belief, having a dog or cat in the home does not improve the mental or physical health of children, according to a new RAND Corporation study. The findings are from the largest-ever study to explore the notion that pets can improve children's health by increasing physical activity and improving young people's empathy skills. Unlike earlier smaller studies on the topic, the RAND work used advanced statistical tools to control for multiple factors that could contribute to a child's wellbeing other than pet ownership, such as belonging to a family that has a higher income or living in a more affluent setting. The results are published online by the journal Anthrozoos. The study analyzed information from more than 2,200 children who lived in pet-owning households in California and compared them to about 3,000 households without a dog or cat. The information was collected as a part of the 2003 California Health Interview Survey, an annual survey that for one year also asked participants about whether they had pets, along with an array of other health questions. Researchers did find that children from pet-owning families tended to have better general health, have slightly higher weight and were more likely to be physically active compared to children whose families did not have pets. In addition, children who had pets were more likely to have ADD/ADHD, were more likely to be obedient and were less likely to have parents concerned about their child's feelings, mood, behavior and learning ability. But when researchers adjusted the findings to account for other variables that might be associated with both the likelihood that a family has a pet and the child's health, the association between pet ownership and better health disappeared. Overall, researchers considered more than 100 variables in adjusting their model of pet ownership and health, including family income, language skills and type of family housing. Researchers say future research could examine associations involving pet ownership over longer periods of time and in more experimental settings. The ultimate test of the pet-health hypothesis would require a randomized trial where some people are given pets and others are not, with the groups being followed for 10 to 15 years to see if there are differences in their health outcomes. “Such a study would likely be too costly and/or infeasible to implement, and I'm afraid it's not likely to be funded by anybody,” Parast said. Support for the study was provided by the National Institute of Child Health and Human Development. Other authors of the study are Jeremy N. V. Miles, Beth Ann Griffin and Jessica M. Saunders, all of RAND, and Susan H. Babey of the UCLA Center for Health Policy Research. Jeremy N. V. Miles, Layla Parast, et al.